The restoration of the heather from the birch scrub surrounding the last surviving patch of heath on site means that the reptiles on site will continue to thrive for years to come. The replacement of the boundary fencing to allow for the introduction of our very own Shetland cattle to improve the woodland structure and encourage more wild flowers, ground nesting birds and invertebrates on site. They graze the whole site, keeping glades and rides open, gently poaching areas to create ephemeral pools, and branching up trees. 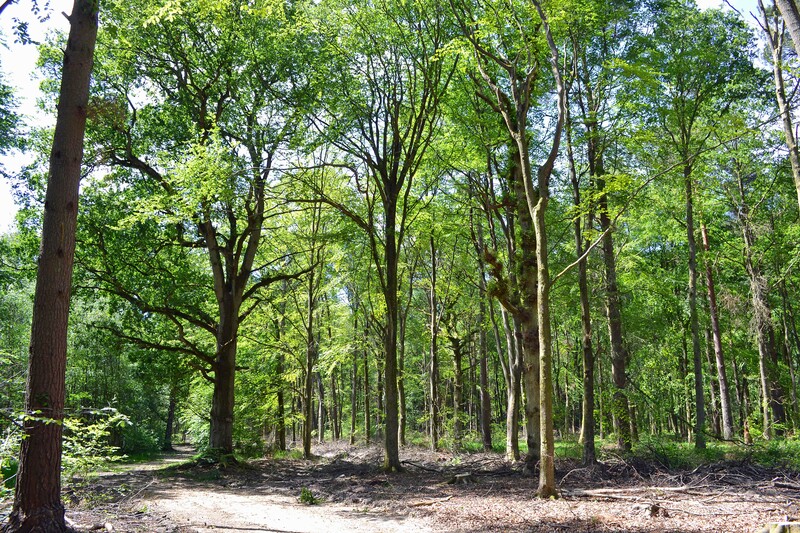 30 percent of the trees on site have been felled in a thinning contract to open up more light to those trees remaining and allow them to be healthy and strong, this will encourage veteran trees of the future as well as improving the woodland under-storey for birds such as the nightingale. Improvements to the existing permissive access route on site to allow for the comfortable passage of pushchairs. 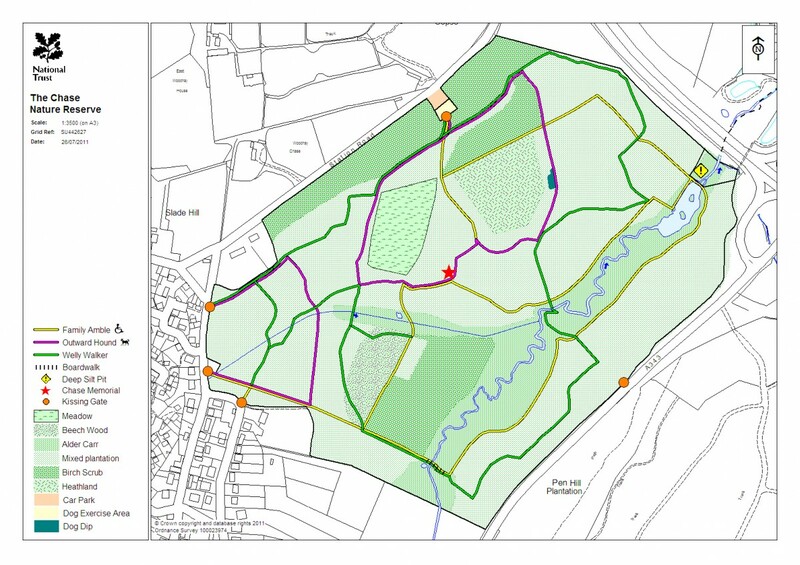 Designation of two new way-marked routes on site, one designed specifically for dog walkers and includes a dog dip to allow your dog to get wet on site and a welly trail designed for those that want that “off piste” experience. We insist that all walkers remain on the way-marked footpaths at all times to reduce compaction from footfall which leads to a loss in ground flora, in addition to avoiding any accidental disturbance of reptiles or ground nesting birds. We have re-designed and re-built the site car park facility off Station Road together with an adjacent dog relief area. This is an area for your dogs to run around off the leads, socialise and play before you enter the Chase when we expect all dogs to be on leads for the protection of wildlife on site from accidental disturbance. I’m dissapointed with the changes to the Chase. Barbed wire fences are not my idea of a nature reserve, particulaly since they border paths where children and dogs are intended to walk. Presumably the deer will learn to avoid them ! The dog-dip is an interesting idea….full of stagnant water. My dog smells enough already thanks ! Its a pity dogs are not allowed into the lake to clean them-selves off. Thank you for your comments. The barbed wire is a necessity on site for the management of our conservation grazing Shetland cattle. There has always been a barbed wire fence that surrounds the Chase though this has been in disrepair for some time. The new, strained, intact fence is much less of a safety hazard than the old rusty, broken one. There is no need to worry about the deer, even Muntjac are capable of jumping great heights from standstill. A deer-proof fence would stand at eight foot high, our short fence is a far cry from this so they will continue to be able to move freely in and out of the Chase. We put in the dog dip at the suggestion of the public and we have included a through pipe so that there is a flow through the pond when the levels are high. We have also left two small, shallow pools at the edge of the lake for dogs to paddle in. However we will not allow dogs into the lake or on the bank edges as this causes loss of vegetation and biodiversity on site which as a nature reserve is our main responsibility.